Still young and working at Tower Records, I'd long been a fan of Tavener's when The Protecting Veil made its debut on CD (I believe before the work premiered in the 1989 Proms). Cellist Stephen Isserlis had suggested Tavener compose a large scale work and it seemed a natural that the composer, (a fairly new convert to the Greek Orthodox Church) would select as topic the solemn celebration of the "Protecting Veil of the Mother of God," I recall the haunting image work on the cover (a Virgin Records release) and rushing to bring it home. My roommate - who at the time listened to nothing but death and speed metal, joined me and we sat in silence for nearly an hour as the eight connected movements of "The Protecting Veil" washed over us. I was (shut up) in tears more than once during the experience from the sheer beauty and power of Tavener's masterly manner of moving from haunting, shimmering sounds to powerful swells of emotion. (and themselves) and not to please critics. The Protecting Veil holds a unique spot in contemporary/modern music in that a little over 20 years after its premiere it has received a number of recordings on major labels including those by Maria Kliegel, Yo Yo Ma, France Springuel, Raphael Wallfisch, as well as two separate recordings by its creator, Mr. Isserlis. I can't think of anything composed in the past twenty years that quite matches this success (and which still divides listeners). If Tavener's other works haven't quite reached the popularity level of Veil, there are plenty of them well worth exploring to those not yet familiar with his compositions. If I were to suggest a single one to "whet the whistle," as it were, it would be his splendid mass/dramatic work Lamentations and Praises, composed for the ensemble, Chanticleer. I recall reading an acquaintance's enthusiasm and the moving experience he had attending the premiere of this piece back in 2001. 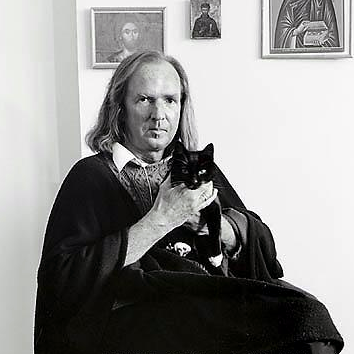 The news of Tavener's death, particularly at such a young age, is sad news indeed, despite lifelong health issues. He was and remains a unique, very individual voice, a composer almost obsessed with his spiritual nature, its mysteries and whose work may not speak to all, but still has plenty to say to those willing to listen. My thoughts and prayers go out to his wife, family and other loved ones on this sad occasion. Rest in Peace, Mr. Tavener.